When Hitler invaded Warsaw in the fall of 1939, hundreds of thousands of civilians were trapped in the besieged city. The Rebbe Joseph Schneersohn, the leader of the ultra-orthodox Lubavitcher Jews, was among them. When word of his plight went out, a group of American Jews initiated what would ultimately become one of the strangest—and most miraculous—rescues of World War II. 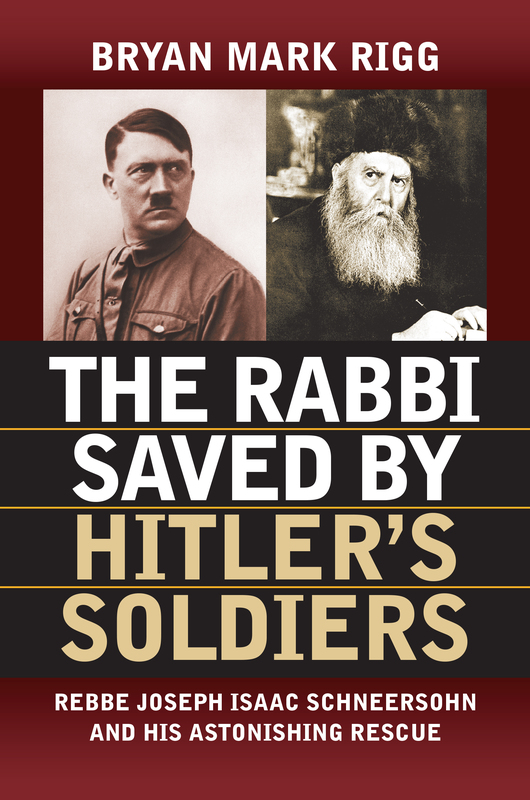 And this is the incredible but true story that Bryan Mark Rigg tells in The Rabbi Saved by Hitler’s Soldiers. Amid the chaos and hell of the emerging Holocaust, a small group of German soldiers shepherded Rebbe Schneersohn and his Hasidic followers out of Poland. In the course of the daring escape—traveling by train to Berlin, rerouted to Latvia and Sweden, and carried by ship through U-boat-infested waters to America—the Rebbe would learn a shocking truth. The leader of the rescue operation, the decorated Wehrmacht soldier Ernst Bloch, was himself half-Jewish, and a victim of the rising tide of German anti-Semitism. Perhaps even more remarkable were the central roles of Admiral Wilhelm Canaris, head of the Nazi military intelligence service, and of Helmuth Wohlthat, chief administrator of Göring’s Four Year Plan. Pursuing every lead, amassing critical evidence, pulling together all the pieces of what could well be a political thriller, Rigg reconstructs the Rebbe’s improbable escape, and tells a harrowing story about identity and moral responsibility. His book is the definitive account of an extraordinary episode in the history of World War II. Bryan Mark Rigg is the author of Hitler’s Jewish Soldiers, which won the William E. Colby Award for Military History, was featured on NBC-TV’s Dateline, and has been translated into eleven languages. He is also the author of Lives of Hitler’s Jewish Soldiers: Untold Tales of Men of Jewish Descent Who Fought for the Third Reich.